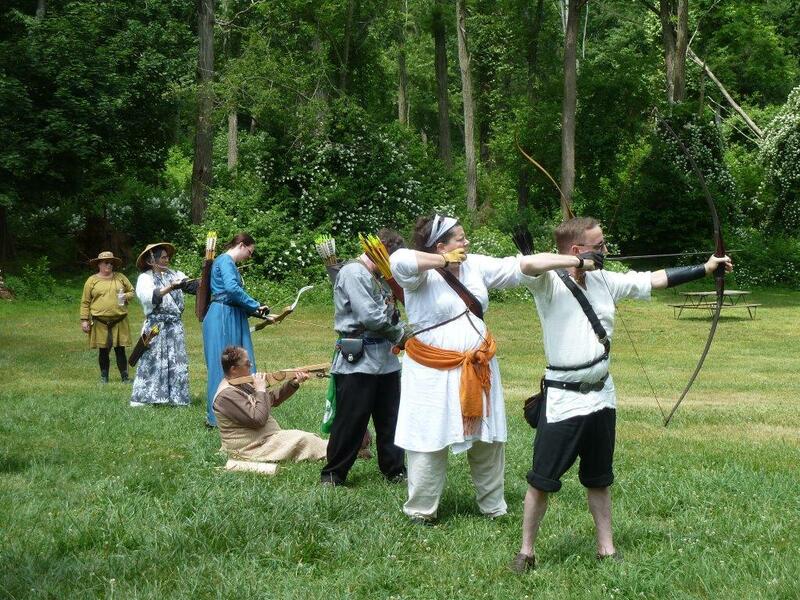 May 30, 2015 was a hot and humid day in Carillion, as 55 archers took to the range to vie for the honor of serving Their Majesties as Royal Archery Champions. Queen Etheldreda gave Her encouragement to those gathered, Master Rupert the Unbalanced and Master Peter the Red (the retiring champions), and Captain General Jehannine de Flandres provided instructions and thanked helpers, and the tournement commenced. 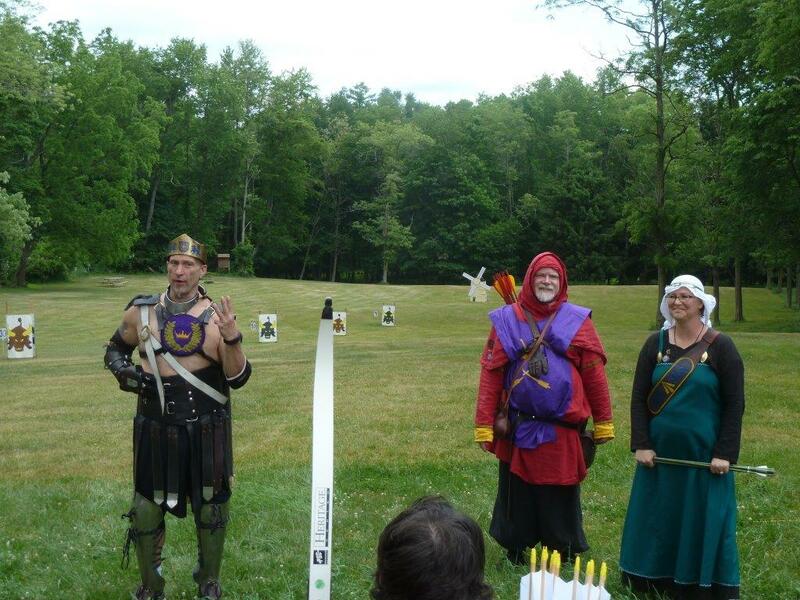 The 16 finalists were addressed by King Omega and Queen Etheldreda. The overall winner of the competition would be the Queen’s Champion (per usual), and the King said He would select His Champion from among the other finalists (as has been occasionally done in past years), then the shoot-offs between pairs of seeded competitors began. 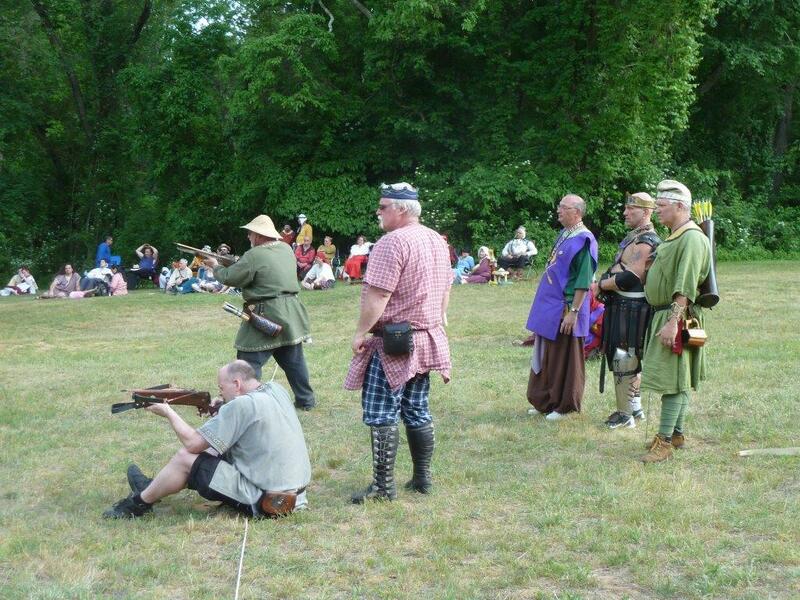 Each archer had to knock down six “books” from a shelf, and the first to shoot a final, center target would advance to the next round. 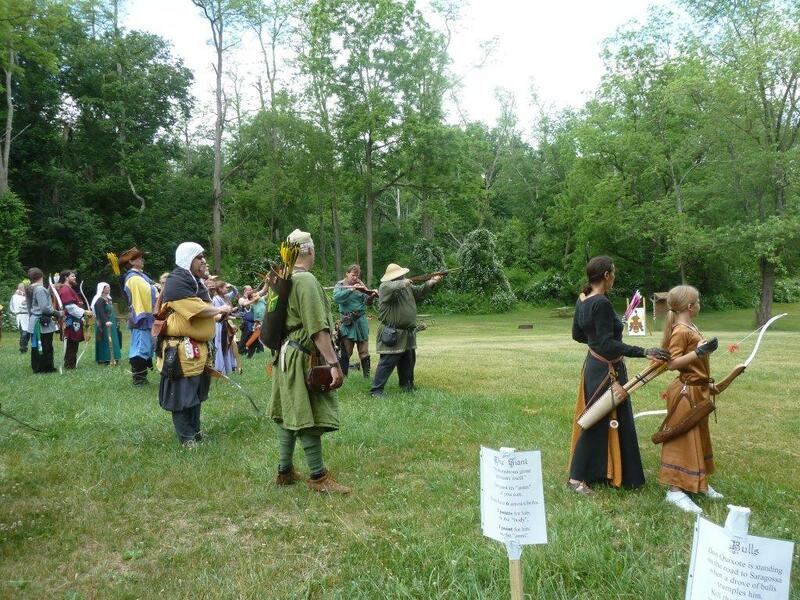 Between rounds, the shooting line was moved, and several books were replaced by smaller ones. (It is worth noting that the “books” were such famous works as Facing the Perils of Castle Anthrax by Sir Galahad, Distribution of Wealth in a Medieval Economy by R. Hood, PhD, How to be Very, Very, Quiet While Hunting by Sir E. Fudd and other similarly lofty titles.) 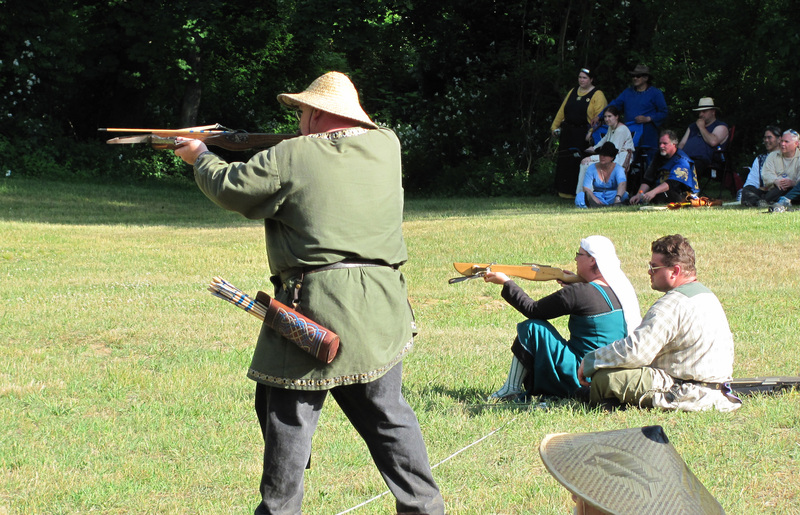 The final pairing was a hard-fought contest between Baroness Jehannine and Master Li; she was ahead by two targets, then he caught up and hit the final target a split second ahead. Queen Etheldreda congratulated Her new Queen’s Archery Champion, Master Li Kung Lo. 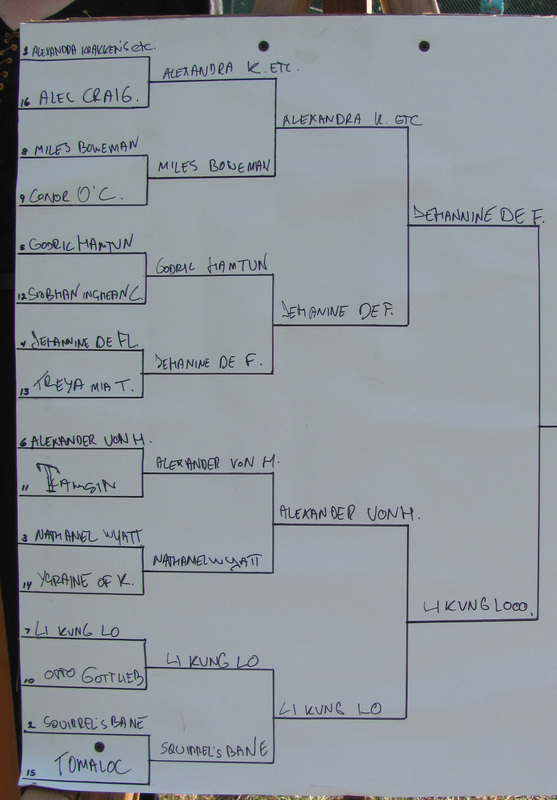 Because of the excitingly close finish, King Omega selected Baroness Jehannine de Flandres as His King’s Archery Champion. For those who keep such statistics, the 16 finalists were evenly split between handbow and crossbow, and this year six of the final archers were women.